Something I don’t really talk about very often is my idols in the industry. There are so many ‘Celebrity Trainers’ out there and people assume they are all experts and what they say is gospel. When in reality it’s not like that at all. Like in any kind of industry there are good and bad trainers out there. Just because one is on TV or wrote an article doesn’t mean they know everything. I’ve seen some ‘Celebrity Trainers’ do some horrible and unsafe things to their clients but people still listen to everything they say. Don’t get me wrong I am in no way saying I am better than them, I still have a lot to learn and will always keep educating myself as much as I can so I can guide all my clients and anyone that needs help. I wanted to take this opportunity to talk about one person in the industry who I really look up to. This person is a “Celebrity Trainer” but he is that little bit different. Just by looking at the way he handles himself and how he cares about people in my opinion really makes him stand out. 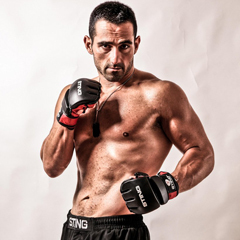 So the biggest idol I have in the health and fitness industry is the founder of Thump Boxing Christian Marchegiani. Christian was an overweight child that got bullied for years and began to suffer from depression, eventually leading him to joining a gang and getting in trouble with the law. A judge gave him 3 choices; he joined the army, went to jail or joined a boxing gym. Christian’s choice was boxing. He then went on to lose 50kg, complete a University Degree in Exercise Science and start up, in my opinion, the best boxing for fitness program in the country; Thump Boxing. Christian also works a lot with charity groups. He has worked with Project Hammer, raised money for orphanages in Papua New Guinea, St Vinnies CEO Sleep Out, did a charity bike ride to raise money for bullying and depression, volunteered during the Queensland floods and many, many other things. He is currently the boxing and conditioning coach for the Sydney Swans, Australian Cricket Team, numerous Olympic Athletes and was the Coach on 9 Networks Excess Baggage TV Series. There are so many reasons why I consider this man my idol, but I think one of the biggest ones is that he is a genuine person who actually cares. Please feel free to follow him on social media and listen to what he has to say; I do.